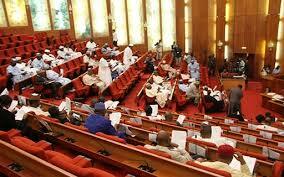 The Senate , on Wednesday, confirmed Professor Steven Ikani Ocheni ‎and Suleiman Zarma Hassan as ministers of the Federal Republic of Nigeria. The letter of the duo’s nomination was read on the floor of the Senate on the 29th of March, 2017. Senate President Bukola Saraki presided on the day the letter was read. Before their confirmation, Ocheni and Hassan were questioned by lawmakers on issues bothering on the economy, corruption, poverty reduction, recession and workers’ welfare. The grilling only lasted for about 30 minutes, after which they were told to take a bow. Ocheni was nominated more than one year after a former Minister of State for Labour, Mr. James Ocholi, died in a ghastly motor accident, along Kaduna-Abuja road. Similarly, Hassan is to replace Amina Mohammed, who currently serves as the Deputy Secretary-General ‎of the United Nations (UN). She resigned in February, while President Buhari was away in the United Kingdom (UK) for a routine medical checkup. Professor Ocheni, until his appointment, was a lecturer in the Kogi State University. The letter nominating them had read: “In accordance with section 147 (2) of the 1999 constitution of the Federal Republic of Nigeria as amended, I have the honour to forward the underlisted ministerial nominees for confirmation of the Senate.Stephen Ikani Ocheni (professor), Kogi State and Suleiman Zana Hassan, Gombe State.